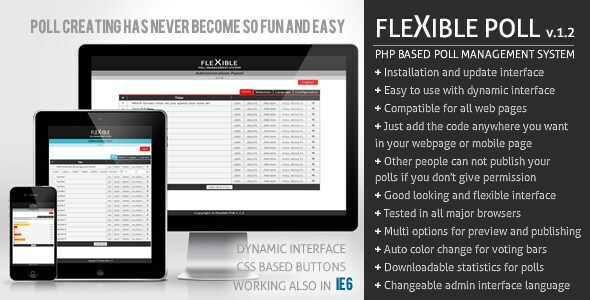 This PHP Script Flexible poll is a dynamic poll management system. It is flexible, because you can publish it in any height and width on any web pages, no matter asp or php based. You can create awesome polls as you wish and you can add them to your web pages easily and securely. If you don’t allow to other people, they can not publish your polls on their website. There is a visual graph interface for poll results in the administrator panel and you can export poll results as .csv, .xml or .pdf files from this panel. There are also several options to preview your polls after you created them. And don’t worry, this system is compatible for all browsers. 0 Response to "Flexible Poll v1.2 PHP Script"